Hello readers! Are you a K.A. Tucker fan? (Of course you are, that was a redundant question.) 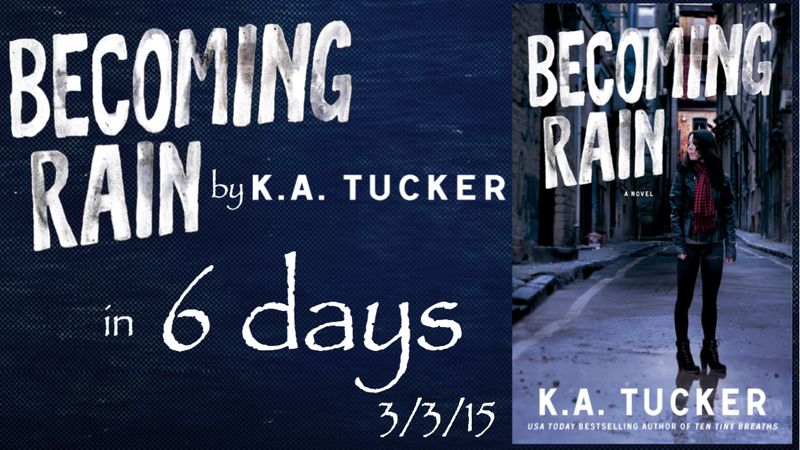 I am exceedingly excited to give you an exclusive interview with Tucker on her newest book, BECOMING RAIN, releasing March 3, 2015. If you loved BURYING WATER, the first book in this series, you are going to be completely enamored with BECOMING RAIN. 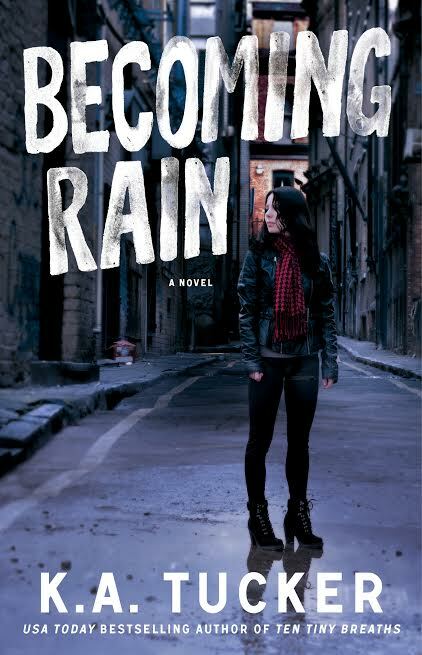 Don't forget to join the giveaway at the bottom of the page to enter for a chance to win a signed copy of BECOMING RAIN, open internationally! This book was honestly such a phenomenal read. What inspired you to write it? When I introduced the idea of a car theft ring into BURYING WATER, I knew that I'd want to write more about it. It's an unusual topic that hasn't been overplayed, and there were many ways that I could take it. Luke Boone was obviously the perfect protagonist for it. My readers know that I like my characters flawed, and there was no doubt in my mind that Luke Boone was just that. He's young and somewhat naïve. His main focus is on money, and his values are skewed by an uncle who isn't evil or cruel in the sense that you would think him to be. I knew it would be a challenge to portray him. Clara Bertelli is one of my favorite heroines I’ve read about. Her voice is entirely unique and authentic. She’s got sass, determination, and a bit of a soft spot for hot mechanics (I’m with you, Clara, 1000%). What was your writing process when you created Clara’s character? Creating Clara was tough. I had to take the very practical, career-focused, right-and-wrong side of her, and merge that with a softer "human" side, that can be swayed by emotions and needs. 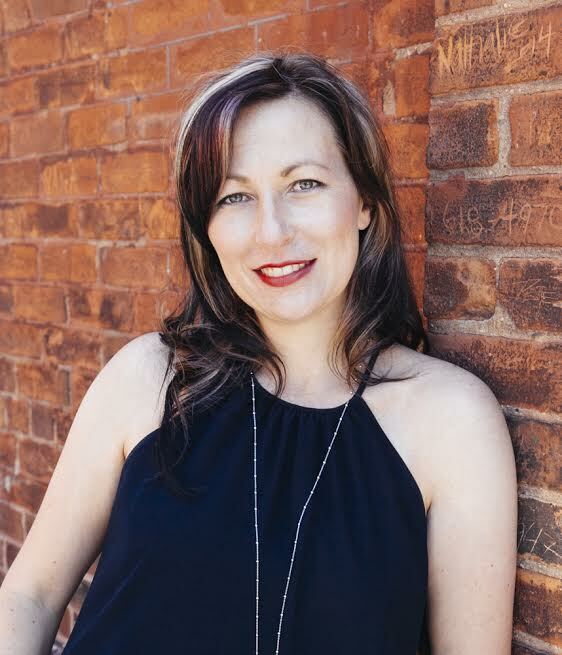 I'm fortunate in that I have a very good friend who is an undercover police officer, so I was able to ask her (countless) questions and bounce ideas off of her. The suspense in BECOMING RAIN is SO real. What do you like best about writing romantic suspense novels? Suspenseful stories add that level of complexity and conflict that, as a reader, I crave. As a writer, the plotlines are multifaceted but at the same time easier to write because I have more character motivations to work with. Luke Boone’s uncle, Rust, is a pretty shady character. What kind of research did you have to do in order to fully bring out his character’s persona and business? I did a lot of reading (news articles and non-fiction books about how these crime rings operate), and I asked a lot of questions of my friend, who has personally worked on a car theft ring case. In terms of Rust specifically, I'd say he's a somewhat unconventional bad guy. I really wanted him to be more than one-dimensional, so I let the reader see two sides of him: the criminal and the loving uncle. Back to Luke, because I’m hopelessly in love with him and I’m A-Okay with it. What/who inspires you to write such endearing heroes? I find flawed characters fascinating; especially when I can give them redeeming qualities and turn them into someone you would root for, or sympathize with. The great guy who always makes the right decision is completely fictional to me. No human being always makes the right decision. Without giving away too much to the readers, what was your favorite scene to write? The scene in Portland's Japanese Garden. That's where Luke really begins to express himself, and Clara (as Rain) begins to realize exactly how much trouble she's gotten herself into. Plus, I can picture them lying beneath that canopy of branches, in the rain. Can you give us a sneak peek on what we should expect with CHASING RIVER, the next book in this series?